On Saturday, September 15th, graduate students, faculty, and staff in the WKU Folk Studies Program and Kentucky Folklife Program partnered to produce the Chattin’ on the Porch stage at the Horse Cave Heritage Festival in Horse Cave, Kentucky. A yearly tradition, this event serves as a key opportunity for Folk Studies students to gain fieldwork and festival production skills. 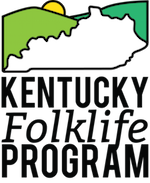 Under the guidance of Kentucky Folklife Program staff and Folk Studies faculty, students take the lead in presenting the event: students interview local tradition-bearers from Horse Cave and Hart County live on stage, document the stage with professional video and audio recording equipment, and learn how to set-up the stage’s sound system (from the mixer to the microphones). This year’s stage discussions centered on community cookbooks, landmark moments in high school basketball in Horse Cave, and hair traditions in Horse Cave’s historically-African American neighborhood, Henrytown. The stage also featured a demonstration of Linda Melloan’s award-winning blackberry cobbler, as well as a conversation with local artists Jennifer and Jesse Sims of Sims Studio. Folk Studies and Kentucky Folklife Program faculty, staff, and students in front of the Historic Thomas House in downtown Horse Cave, Kentucky. Top row, left to right: Dr. Ann K. Ferrell, Brent Björkman, Dr. Tim Frandy, Virginia Siegel, Maria Lewis and Hunter Bowles. Middle row: Aaron Kiser, Sam Kendrick, Joel Chapman, and Zahra Abedi. Front row: Kate McElroy and Eleanor Miller. Photo by Sandra Wilson, 2018. Dr. Ann K. Ferrell and Hunter Bowles interview Linda Melloan as she demonstrates her famous, award-winning blackberry cobbler. Photo by Kate McElroy, 2018. Linda Melloan passes out samples of her famous, award-winning blackberry cobbler. Photo by Kate McElroy, 2018. Brent Björkman (far left) and Eleanor Miller (far right) interview Beverly Nuckols, Temisha Garnett Hardy, and James Percell about their memories of playing basketball in high school. Photo by Aaron Kiser, 2018. Virginia Siegel (far left) and Kate McElroy (far right) interview Donna Logson, Janet Schneider, and Charles Williams about community cookbooks. Photo by Hunter Bowles, 2018. Zahra Abedi filming the stage. Photo by Kate McElroy, 2018. Eleanor Miller audio records and logs the stage while Aaron Kiser monitors the sound mixer and audio levels. Photo by Maria Lewis, 2018. Previous Previous post: Join us for the Horse Cave Heritage Festival!